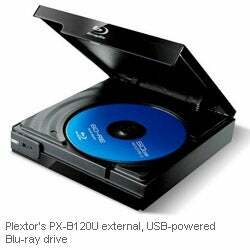 Plextor's PX-B120U external, USB-powered Blu-ray drive adds data backup and high-def video capabilities to even the most basic portable PC. Entrepreneurs who’ve opted to save on notebook PC purchases by buying cost-affordable laptops or netbooks may note some obvious hardware omissions. Specifically, these machines often toss multimedia components such as video cards, media card readers and DVD drives so as not to sacrifice processing power, memory or hard drive space. Enter Plextor’s clever new PX-B120U external Blu-ray drive ($99.99), which aims to add back some of this functionality at a reasonable price. To use the device, which stows comfortably in a laptop bag or briefcase, all you need is a USB cable to connect it to your notebook computer. No additional cords or components are required, meaning you won’t have to pack along a bulky adapter or hunt for power outlets. Attach the device to your PC, and it doesn’t just empower you to watch Blu-ray and DVD movies, or access files you’ve archived to custom discs. It also lets you burn CDs and DVDs, making a handy way to back up information (files, folders, documents, music, videos, etc.) while on the go, helping guard against potential data loss. Unfortunately though, it won’t write to Blu-ray discs, which offer greater storage space. On the upside, long layovers should go much quicker in the gadget’s company, as you can easily queue up all your favorite movies and TV shows. It also provides a ready way to burn last-minute product demos in your hotel room for handoff to clients at tomorrow morning’s meeting. Whether enjoying training videos or corporate presentations while cruising at 20,000 feet or simply accessing a collection of PowerPoint presentations or prerecorded conference sessions, it quickly proves a robust tagalong. Connect it to the forthcoming PlexMedia player, and you can even output footage right to your HDTV as well, in case you need an evening on the couch or want to screen videos for a large audience. Slim, sensible and value-minded, the PX-B120U will never be movie lovers' first choice for watching their favorite films and television shows. But small-business owners are all but certain to find it a welcome and wallet-friendly solution for enjoying multimedia or reproducing data discs while on the road. As an added bonus, the gizmo even offers the ability to upscale standard-definition DVDs to high-def playback for superior visual performance. Whether you’re busy burning off demo reels or presentations as client takeaways or simply killing time during a layover, consider adding it to your list of must-haves to pack on any business trip.